Mobile gaming has become very popular in recent years and today you can play some of the most popular online pokie games on your mobile device anywhere and at any time. There are also free apps where you can enjoy all of your favourite games on any device. Mobile casinos have been around for quite a few years but they didn't really take off until smartphones took over from the older style handsets. The bigger screens, faster networks and better graphics that smartphones feature has made playing on your mobile a much better experience. At the moment the amount of mobile games is still much lower than the amount of games you can play on your desktop PC. New games are being released quite frequently so we should see mobiole catching up with the desktop versions quite quickly. The game range varies based on the device you use with the Apple iOS and Android devices having the biggest selection. A smaller selection of games are available for Blackberry and other handsets. 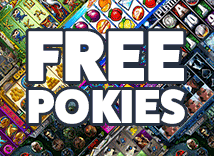 While it can be fun to play the free pokie apps like Slotomania, in our opinion nothing really beats the excitement of playing with real money and winning real jackpots. Why spend money buying coins on free apps when you can't win anything but virtual trophies? All of the mobile games we've reviewed are played directly in the web browser on your phone so you don't have to download anything to get started. If you've already joined a casino on your desktop computer you use the same details to login to the mobile casino.